One week ago I released a brand new project called Velveteen. (Get it digitally HERE + physical copies HERE). I’m pretty excited about this collection of songs, because I wrote them not from other people’s stories but from my own. I could never have foreseen either the tragedy or the gifts that are coming through the tragedy, but they are both real. Well, friends, the time really got away from me this fall! While it's not quite as wintry here in Nashville as in this lovely photo, it's getting a bit brisk for the thin-skinned (me) and Christmas is a mere 15 days away! Somehow between tour's end and now, I failed to post about the two most recent songs released through Tune Tribe! These two happen to be a couple of my favorites this year, so I don't want to leave them out. ALSO, since it's December and you just might need gift ideas for a special music-maker in your life, I have some great suggestions for you at the end. It was campaign season here in the States, and like most everybody, my ears were so tired of the ugliness. Many of us had to be intentional about taking a break from social media because it can become so unhealthy to feed on the strife. It was a challenge to me, too, because I want to know how to be a good listener and share my thoughts in a loving and open way. So on the first leg of the Three Birds Tour, while I drove from Atlanta to Nashville alone, I kept the radio off and started thumping on the steering wheel and singing this melody a capella. A totally new approach for me, as I typically have to be at the piano to write. The accompanying artwork by Mandy Rogers Horton is appropriately titled "Noisily Day and Night." This piece of Mandy's is titled - also aptly - "Something I Cannot Name." Digital Downloads - If you're new around here and are interested in getting these and the rest of the year's song demos digitally, you can subscribe HERE ($10) & we'll send you a link to stream/download (wav + mp3) at your leisure. You'll get 11 songs now plus one more next month and the opportunity to vote for the ones you think I should include in my next full-production album. Would love to have you join in! Physical CD - Order a copy of Tribe Songs, my home-brewed album of all these new song demos I've recorded with Jess Ray this year. I'll send you a hand-labeled audio CD with 11 previously unreleased songs. 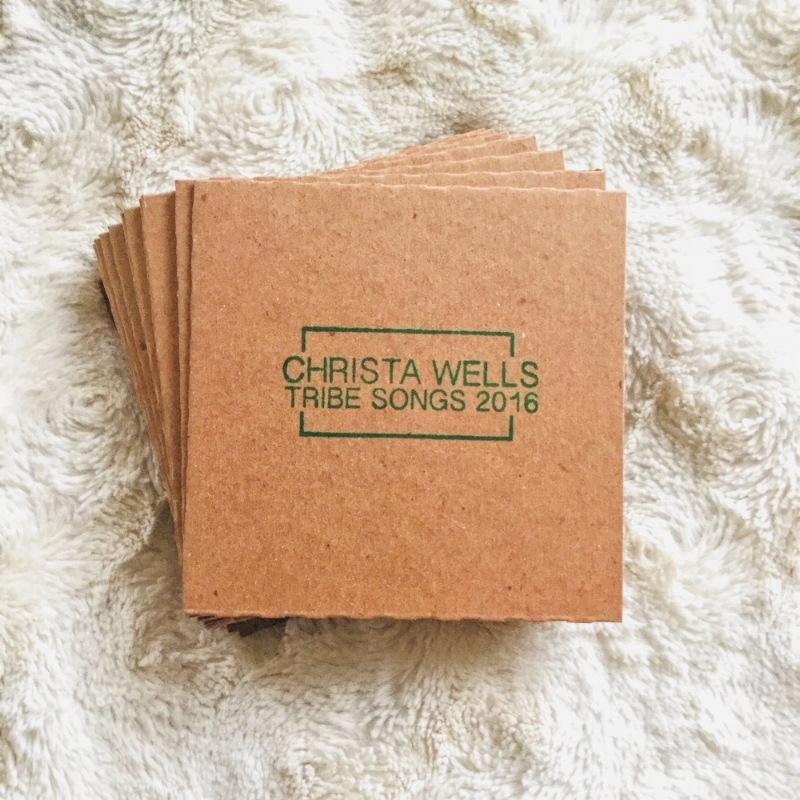 Click HERE to get your copy of Tribe Songs ($12). Everyone has their preferences. In recent years, I've used basic marble composition books. My most treasured one was a small-sized soft leather journal with a string that wraps around it. Small enough to not be intimidating, lovely enough to be inspiring. I also recommend books of poetry and great fiction, both great food for the soul and inspiration for songwriting! SUBSCRIPTION to American Songwriter magazine. This is truly a great gift for any music-maker. I only wish I had time to read every issue cover to cover! CONCERT TICKETS - There's almost nothing more helpful to a musical artist than to actually go see live performances. If cost were not an issue, most of us would be attending a lot more of these events & would be better for it. Don't just look for the big productions, though. Those are a lot of fun, but your typical working artist needs real inspiration and ideas that can come from enjoying a great performance at a more intimate venue. It's so helpful to be up close and learn how to share music in an effective way without the big machine & lights. I also recommend giving tickets to theater productions and arthouse movies. Most of us will spend the money to see a mainstream film that's gotten great reviews. Fewer people take a "risk" on indie films, but those can be the most provocative and interesting. Read reviews & get two tickets so you can go together and discuss after! If your writer is ready to share their work publicly, you could plan a concert in your own home and invite your neighbors, co-workers and family. Being a host is always a gift to yourself as much as anyone else. It takes a bit of planning and effort, but it's so worthwhile. You don't have to have a lot of space or a fancy house. Just space for some friends to gather & listen - everyone will thank you! Masterpiece Project - Masterpiece is a creative arts camp for high schoolers in southern Kentucky. I facilitate songwriting workshops there one week each summer and cannot speak highly enough of this experience. It's exactly what I wish I'd had when I was 16. Escape to the Lake - This non-profit organization is all about promoting "gourmet" faith-based music, and their annual 4-day music festival is unlike anything else. The biggest difference is that it's small, no green rooms, no smoke and mirrors. Your songwriter will get to sit at the lunch table with the performing artists and writers, talk around the campfire, play at an open mic, and attend panel discussions. AND the festival is usually prefaced by a 2-day songwriting bootcamp! This is a fantastic opportunity, another one I would have loved to have had early on. Help your writer get a song professionally recorded. Cost can range from $200-1500. Find some local producers, listen to their work online and make sure you like what they do, and consider the purpose of the demo before determining your budget so you don't over-spend. This can be an exhilarating experience for a new writer and would be a fantastic gift! I know Spotify and Apple Music are the go-to, but here's the thing. They pay us next to nothing. The reality is musicians NEED to be paid for their work in order to keep creating it. Encourage your artist to pay for the music he/she loves most by giving an iTunes gift card. Or give a vinyl copy of a favorite album to your younger listeners. Physical CDs for the car. And maybe give music that has stood the test of time, something a young writer can learn from and enjoy. If your creative person is married to you or has children, the best gift you could give them is TIME & SPACE. Take the kids for a whole day or one night a week and let her write in peace! Or surprise him with a room or space set up just for his composing. Simple, free, and oh so meaningful! We all need them, and the good ones are usually expensive. Help arrange and pay for their next session with someone who specializes in artist photography! You can build your own, but some of us could use a little help taking it up a notch. Or maybe your friend doesn't have a domain yet and you could buy the domain in their name so it's ready when they are! 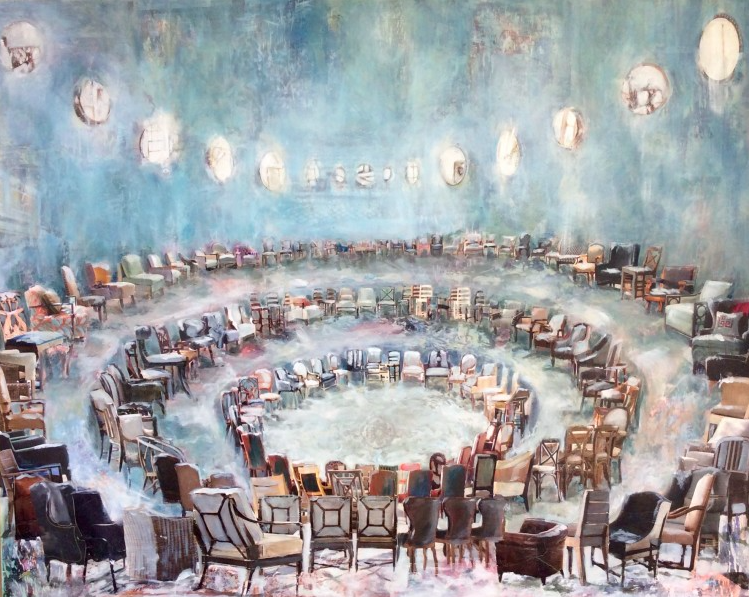 Through a group we've started called ARTIST AND, my friend Nicole Witt and I also periodically host online gatherings of about 8 people at a time to discuss particular themes related to artmaking. Join the Facebook community ARTIST AND to stay in the loop! So I think that's a wrap (heh heh) on gift ideas! Have something you'd add to the list? Please leave suggestions in the Comments section. Love to you and yours as we wait & prepare for the glorious coming, now just a couple of weeks away! I shared with my email list last week that I won't be recording an album this year but instead invite you to join a tribe of listeners who will be able to stream or download a new song each month of 2016. Album projects are amazing, but it's also amazing to share a new lyric and melody with your friends while it's fresh from writing and you're still living the story. So every month Jess Ray and I will go into her home studio and lay down acoustic production on a new tune. If you join the tribe ($10), you'll get a little note in your Inbox each month letting you know your new tune is ready (mp3 & wav available). Download right away, or wait and get several at a time when you're in the mood. These songs will not be available elsewhere this year, but you may be hearing the demo of a future single, who knows? To top it off, each track will be paired with an image of an original piece by Mandy Rogers Horton, whose artwork was featured on the COVERS ep. "Lighter From Here" is our January song, and it's ready, folks. Head on over to The Store if you're ready to take this musical journey with us. 2015 brought some hefty trials into our life, and Lighter From Here is my song of response. It's a new year hope rooted in the memory of God's goodness and of the faithful return of light year after year. I've written before about my loathing of winter darkness. Well, I was interested to consider a couple of years ago that the longest night of the year arrives just before Christmas. Our hanging of decorations and our songs of Advent waiting and Christmas celebrating are a massive communal effort to persist in hope and survive the shortened days. By the time we take down the white lights and get back to regular routine, the long night has actually passed. It's behind us, the worst. We can expect a literal lightening, slowly but surely, day by day. It's not mere optimism. It's a beautiful and true thing, this faithfulness of nature to reflect the promise that light will win. We may have some winter yet ahead, but I hope you'll hear comfort and even a gradual return to joy in these words and melody. Hear a clip of this new release here & join the Tribe to get all 12 songs. I arrived home Sunday late afternoon after my first weekend out with Plumb's Exhale Tour. For these five weekends, I am the first (and smaller) of two openers, the other being a band from New Zealand called Rapture Ruckus.It's an eclectic line-up, with RR's high energy pop/rap and Plumb's gorgeously massive vocals set against lights and electric guitar. And there's me with my keyboard. I joke, but in truth I humbly and gratefully embrace my role filling the quieter, singer-songwriter space at the front. "Come Close Now" especially resonated with people this week, and they often came to the table asking for "the fire song." It makes me so happy to see again and again that music mystically enters the most sacred spaces of a stranger's life, where I myself cannot go. Our family has been in such an unusual state of upheaval over the past several months that I was unaware of the full extent of my stress level until it began showing up as headaches and sick stomach, which resolved itself once I was settled onto the tour bus. Here is where I interrupt this journal to send out a public thank you - from the bottom of my heart - to the people in our church & family & community (local and far-0ff) who have taken care of us in SO many ways recently. We have been so humbled in a very good way to depend on you & so aware of how real your love is - for us and for God. And how real His love for us is. So, for the curious...the highs & lows of the first weekend on a tour bus? ...initial anxiety of being completely clueless regarding absolutely everything. Here's something true: If you say "yes" to things beyond your comfort zone, you're gonna be uncomfortable. Deep, huh? ...overcoming said anxieties with experience. The great thing about the first time is there is only one first time. You get over the hump pretty quickly. ...the food. Hello. I asked the bands: How do you do this all the time and not weigh twice as much as you do??? Eat, set up, eat, soundcheck, eat, perform, load out, eat, sleep, repeat. ...the black-out curtain on bus bunks. I slept well inside my little coffin. ...being parked in the Chautauqua State Park Saturday, which was beautiful and gave me the chance to escape for a quiet walk. I need nature like some people need Diet Coke. ...NOT having to set up and run a portable PA. It's 1000x easier and more pleasurable to play & sing with a great sound system. ...by far, my favorite thing is meeting the people who volunteer at the events and the people who stop by the table afterwards to connect. I have zero interest in being on any kind of pedestal and find the best antidote is to stay busy working alongside other people, swapping stories. After four nights on the bus, I was greeted by my brother-in-law & enjoyed several hours with him & my sister, Mandy (of COVERS art fame), sipping coffee and eating donuts & pasta (health). I arrived home to cool, gray Carolina skies (tropical storm off the coast), a 6th grade science project, and a delicious rice & chicken dish prepared by friends from church. Daily chores & cuddles & quiet hours of solitude are welcome on these days between travel. Mom arrives to help tomorrow & I'm looking forward to a day with her before I leave. Getting to do this work is a gift. Obviously. I know that well & will remind myself of that on the days when I don't really feel like getting on a plane. Today, I'm home and practicing the art of being present. I sat down to write and realized that today is the 2-month anniversary of the COVERS ep release! We gave away 3,000 full album downloads on Noisetrade the first week. Many thanks to the Kickstarters whose funding made it possible for me to give the music away that week, thus getting it into the hands of so many new listeners. So what happened after Feb 10? Since release day, I've had the pleasure of doing several interviews/podcasts, a small tour in Texas, a writing trip to Nashville, and have spent a good bit of time working up those promised Kickstarter rewards, as well. I'm also carving out time for songwriting--both for me and for other artists--which is maybe most exciting, because one of the things I hoped the COVERS album would achieve for me is a renewed sense of energy in my writing. With spring upon us, I find I'm waking up with my brain exploding, creativity sparking, and it's been noted at the dinner table that my knee is bouncing in that antsy way you do when you've been in a state of flow and had to stop to do human things like talk and eat. At times like this especially, the work doesn't feel like a job but like being alive, at play, outside of time, lost. And found. I told Toby the downside about the writing days where lose myself like this is that my brief hours of solitude are gone before I even look up. Still, it is such a great gift to have work that makes you feel that way; it's a small price for the joy & honor. I'm gearing up for songwriting workshops/events such as Young Songwriters Workshops in Raleigh, Escape to the Lake, Masterpiece Project 2015, and a Writers Retreat some friends and I are leading in Nashville in August (currently being revamped, will repost soon). If you have any songwriters in your life, please have them check out these opportunities to connect with peers & grow in their understanding & practice of the art. I've been practicing with this gifted & oh, so fun group of musicians for the only currently-scheduled full band show on the books. Our COVERS Release Show will take place at Raleigh's Pour House Music Hall THIS SUNDAY, and I couldn't be more excited. If you're in town, please come and enjoy openers Jess Ray and Claybrook and stick around to hear the newly released tunes as well as some originals from past projects! If you've hung in there to read all this, wow! Impressive attention span. I can't tell you how grateful I am to have the privilege of your time and ears. I know you have your own work in front of you & it's good to be in such good company. I keep finding myself in conversations where people are lamenting the shortage of good music in the world and asking for recommendations. Honestly, there is SO much good music being made. You just have to know where to find it. At our house, we listen to just about everything in terms of genre, and we find our music by word-of-mouth, Noisetrade, Spotify/Pandora/iTunes Radio, mainstream radio, and great online curators like Under the Radar Radio. We love it all, and our playlists tend to lead or follow our moods and activities. Okay, and we also disagree. Often. In fact, my personal favorites happen to be on Toby's "most loathed" list. That's okay. It is what it is. I can play OTR as loudly as I want when he's not home to avoid the groans, grimaces and "this is the WORST" comments. So, I'm not going to give you everything, but rather focus a few of my favorites who are a little (or a lot) lesser-known. Because nobody needs me to tell them about "this band called Mumford & Sons." Treat yourself & your people to new music during these long winter months & find joy in supporting some under-discovered artists! p.s. Some of these albums will be included in a giveaway happening here next week! Drawing 3 names from orders placed in November & shipping music, books & a signed Christmas greeting. So, here we go. Artists - and one of their well-loved songs - as a jumping off place for you. Sleeping At Last - "In the Embers"
Over the Rhine - "All My Favorite People"
Nick Flora - "Lost At Sea"
Sara Groves - "It's Going to be Alright"
Andy Gullahorn - "I Will"
Jenny & Tyler - "Song for You"
Shelly Moore - "Tie That Binds"
Eric Peters - "Where Would I Go"
Jill Phillips - "It Will Pass"
Carolina Story - "In the End"
Nicole Witt - New Album Coming! Sanders Bohlke - "I'm Gonna Make It"
Future of Forestry - "Pie Jesu"
Kye Kye - "Peace Song"
Milk Carton Kids - "Michigan"
Salt of the Sound - "Where Do I Begin"
Waterdeep - "Not Looking Good"
Drew Holcomb & the Neighbors - "Live Forever"
Judah & the Lion - "Rich Kids"
Josh Garrels - "Farther Along"
Kaleb Jones - "Hold On Tight" - p.s. I met Kaleb in a coffee shop on Thursday, fell in love with his music & voice, and 4 days later he was singing on my upcoming Covers album. Emily Sage Dempsey - "Grow"
Jansen Hogan - Album Coming! Elle Michelle – "Sleepy Heart"
Jana Gilmore – "Stay With Me Til Morning"
Taylor Leonhardt - "Sunday in the Park"
Happy Thanksgiving to you & your loved ones. These colder months can be hard, which for me means I have to work harder at the practice of gratitude. May your list of gifts be ever-growing. I'm thankful for YOU. It's true. Art encourages us to forge friendships and learn from people we might ordinarily assume we have nothing in common with. Music has made me feel more connected to the rest of humanity - thus, less alone - all my life. A couple months ago I wrote about the song and idea behind "Panning for Gold," and the new work I was thinking about as I wrote was this upcoming EP of cover songs I'm working on with producer Ben Shive. What a good artist understands is that nothing comes from nowhere. All creative work builds on what came before...You are the sum of your influences. I was shaped and fashioned especially by the sounds I soaked in during my teens and early 20s, and I believe they are worth celebrating. If you're not convinced that bringing a new voice to old songs can be worthwhile, I heartily recommend these fine examples by Sleeping At Last, or this one by Greg Laswell. We still have 35 hours to go on rounding up backers for this project. Will you consider joining the team, even if you can only manage pre-ordering the download for $5? That's not too little! We want you in this with us. And if you would bring a few friends along? The more the merrier! In case you missed these on Twitter or FB, here are a couple teasers from last week's show in Raleigh. The band and I had a blast re-imagining these favorites from The Smiths and REM. Not saying these are definites on the album or that these would be THE arrangements, but maybe you'll get a taste of the possibilities. Thanks. Thanks for being here with me. My parents are pretty amazing, no doubt about that. My childhood was filled with enough love to make the frequent relocations more than bearable, our house filled with people always. I have no complaints. But as they slowly opened the doors for us to explore music and film during our teen years, they also taught us to pay attention. To think for ourselves. To listen and work to discern truth and notice all the big and small ways Truth gets told in stories that aren’t necessarily telling - or trying to tell - the whole gospel truth. Above all they showed us that all people are worth our attention and that there’s nothing more important than looking for things to love in others. Over time, for me, that theme has carried over into the way I see all of life--our books, films, music. There’s gold just about everywhere. Maybe all our moments--of triumph and failure and longing and love and humanity--are moments within the great story. It’s a game of Where’s Waldo or I Spy. Give us something well-made, thoughtfully crafted, and shaped in pursuit of excellence. Don't we want to spot the good, the true, the hopeful, the redemption, the STORY – even if only glimpses – in the most unlikely places? Cosmos from chaos, as Madeleine L’Engle wrote in Walking On Water. Sometimes the good is more breathtaking for having been discovered like a baby grand at Goodwill. Friends, I’m about to do something different, and I’m a bit tentative. Not because I have doubts. But because I’m so hopeful you’ll want to go down to the riverbed with me and do some panning. I’m so hopeful that you’ll be as excited as I am to put fingers in the sand and trace the true, even in the dark moments of your own journey. Gonna be beautiful. And fun. And truly worthwhile. I want to give you something. Will you take it? Share it? Won't cost you but may keep you company when the power goes out & you're out of matches. Live Songwriter Hangout - Streaming Here Tonight! *This is for a couple of young artists who asked me about jealousy amongst artists & how to find community in art-making. Maybe for you, too? So you were sitting there trying to enjoy a performance when all of a sudden something ugly starts to wake up inside you and you find you're staring at the stage and the performer with less delight than dejection, more jealousy than joy. You're feeling insecure about your work. You feel underused...overlooked...uncertain. If it goes on long enough, you start to get really good at finding fault with those "more successful" creatives. You get critical in an attempt to protect your own sense of worth. But it doesn't work, because instead of fueling better art in you, it makes you bitter, brittle, dry. You weren't meant to be this way, and you don't WANT to be this way. You WANT to be generous and cheer others on. But you don't know how. Nobody likes to feel passed over. You have gifts, you're pretty sure, but have no earthly idea what to do with all those songs/screenplays/ideas/drawings. Or you're trying. But your thoughts and motives are confused, and you don't want to admit it to anyone else, because it's ugly and everyone else seems above it. I don't have answers or a prescription but I've been ugly inside, too, and I've often felt like a big zero. And when I heard someone say to pray for those you do not feel love for, that it would change things, it sounded a bit pious and quite impossible. But I tried it anyway; I prayed for a fellow artist I didn't know personally, whose success felt, for whatever (no good) reason, like a threat to my own. Prayed for her to be fruitful and heard and to get better at her work and find more open doors. I don't know what happened to her through that, but my heart, like the Grinch's, grew 10x bigger. I found it impossible to ask on her behalf and still resent her. My friend, Aaron Rice, says: "Stay in your lane," and I think that's a brilliant way to say it. It doesn't mean you can't try new things. But it means we have to stop looking at what others are doing and get to work. I really believe we're meant to SHINE in unique, inimitable ways. The more I take that advice, the more lovely and useful I am. Like prayer, giving thanks has the power to protect us from envy. Maybe only Mom & Dad care about my music, so I thank God for them. Give thanks for the coffee shop that opens its platform to the unknown artist. Thanks for the life story that gives way to song or story. For the weakness that makes me dependent. For the older man who tells me how that lyric reached a cobwebbed corner of his heart. I learn to give thanks for my own voice, as unimpressive as it seems to me. When we moved to North Carolina, I was at a total loss for artistic community, knowing no one and finding few musicians to intersect with. Art-making can be very isolating, even though music should ultimately be collaborative. We spend a lot of time in our own heads, and it's easy to feel like the only weirdo in your town (or house). There are more of us out here than we think. We have to watch for kindred spirits and create spaces that will draw us together. A lot of times for me it's meant volunteering myself and my time to creative efforts, however small they may feel. It's given me the chance to spend time with others who are at least interested in seeing artful things happen, whether they are artists themselves or not. *Support touring indie artists who come through town. *Host a house show, provide a meal and a space for them to rest. *Search the web for like-minded artists & reach out. *Find artists you respect & ask how you can support them. *Host a meet-up at a local coffee shop for area songwriters & musicians. At the end of the day, we need each other. We really do. We make each other better. There's no room for jealousy or isolationism. There IS room for all of us at this party. Even me. Even you. I would sit in the car before school and obsessively rub more black liner beneath and around my eyes. “Why do you do that?” my cute, sporty sister asked. Because I’m ugly. Because my eyes aren’t pretty and nothing is right about the way I look. “Why does your sister dress like that?” someone asked her. Because she has no idea who she's supposed to be. Which version of herself is true. Because she's drawn to a kind of beauty she doesn’t see here in these horrible school walls, and she doesn’t know how to be like you. My own small bedroom walls & closet doors were papered with magazine images of idyllic scenery and girls in wacky & fanciful ensembles really only worn at photo shoots and not in real life. Those images were the backdrop for my imagined life (read: escapist). I didn’t have money, so I spent hours modifying the clothing I had into something that resembled the girl in my mind that resembled the way I felt on the inside. Because I am a disaster. Because I’ve been the A-student you don’t need to worry about, but I want you to worry right now, because my mind is dark and I’m deeply sad. During lunch hour, I hoped fervently for one or two familiar faces to be easily spotted in the cafeteria. If not, I carried my salami sandwich to some quiet corner of hallway and kept my head down. At least one or two pep rallies were spent behind a locked stall door in the bathroom. Pep rallies were the worst. I literally ached to be noticed, even as I hid behind shyness and long skirts and hair and eyeliner. I dreamed of that moment where one of those confident, popular boys would walk out of a John Hughes script, see the skinny, strangely-dressed girl and believe she was a mystery worth risking his teenage societal status on. I hid inside music, and the music hid me. There were good friends & mentors & safe spaces along the way, but it’s easy to experience and remember that young season in light of the place where we spend the most hours daily and feel the most judged. We moved when I was in 5th grade, 6th grade, 9th grade, and 11th grade. We’d moved plenty before those years, but it wasn’t a big deal until middle school. Everything is harder during the teen years, and moving between different cultures without having the financial means to conform make it harder. Almost every day for the first 3.5 years of high school, I crawled into the shower at 6:30am, sat under the hot spray and meditated on how miserable the next eight hours would be. After school, I cried on the couch, begged my poor mother to home school me. Please, please, don’t make me go back. I hate it. I hate it. Hate. It. We’d lived in the D.C. area just a few weeks when I waited in the lunch line, a scrawny 14-year-old recently returned from four years overseas, and heard three older girls behind me commenting loudly on my hair and clothing. Did you know it’s entirely possible to feel both invisible and conspicuous all at once? Invisible, immaterial, irrelevant, unnoticeable. Conspicuously wrong, unattractive, unfashionable, resist-able. Why I am telling you all this? It's not a pity party. Really. This was a long time ago. It’s because I see you. I feel compelled to write this down, the same way I felt compelled to write to creative mothers a few months ago. It's for the invisible. The ones who are reading this now and are quite sure I’ve been spying on you, because this all sounds a little too familiar. You stand outside the circle, whatever that means. Seemingly locked out of what looks like joy and you have no inroads. You see no similarity between you and the beautiful, interesting people strolling, laughing their way through life. You don’t know your own talent. Or you have an idea of it, but no one else is convinced. You look inside and find nothing brave, only fear and anger and jealousy and sadness. You want to get out of this place. No other destination is in sight, but you’re hopeful there’s something, some bright place of belonging, out there. I understand. And there IS. There is a Place of Belonging in the Person of God. Those words are not a consolation prize. That’s the kind of TRUTH that will lift you right off the ground if you let it. I didn’t come to give advice, but I’d be failing you if I left that unsaid. People ask what I’d say to my younger self, and I don’t know what might have helped that girl. Maybe hearing the story of someone who walked that road and went on to lead a semi-normal life? Maybe a couple of songs written/recorded by the same girl a few years apart? The first a snapshot of that time taken just a few short years after. The second a bit further down the road when things can be recalled without as much sting. Time changes lots of things, and if your eyes are open, time will change you for the better. Awkwardness shall pass (well, mostly) and wisdom will take the pain of those crappy years and shape you into a stronger and more sensitive, more seeing, human than you would otherwise be. You’ll be one to notice and believe others are worth the risk. You’ll write a song or a book or an email you wouldn’t have. You’ll be the friend or the parent or the (fill in the blank) you couldn’t have been without the memory of loneliness. I wish I had embraced uniqueness instead of carrying it around like a necessary but unwanted load of bricks in my backpack. I wish I had found the way to thinking about myself less and about others more. I wish I’d listened to truer voices. I was never invisible. I could have been SHINING all along. FEED YOUR SOUL - Release Day! I may start crying if I’m not careful. I mean, we actually did this. Nine months ago, I trembled my way into a Kickstarter campaign and asked for help making another record. Who am I to ask so much from others? But I did. Songs and substance were beginning to well up again, and there didn’t seem to be a way to get them out on my own. This simply would not have gone forward at that time without a communal effort. And you guys stepped out of shadows with so much joy & gratitude (!) it took my breath away. Today was the official birthdate of “FEED YOUR SOUL,” an album of 12 new & original songs that begins with vanity & self-sufficiency and ends in authentic love & community. I did not know where I was going with these songs at first. I didn’t know how they would fit together or what umbrella they might belong under. They terrified me, honestly, and I was often certain they were miserable failures. But you’ve begun to take them out of my arms and carry them with you. And I’m finding out from you that the course was right after all and the work worth the labor pains. So, world, I humbly present “FEED YOUR SOUL,” bashfully placing it at the foot of the mountain of good things. Hopeful it belongs there. And if you agree it was worth the effort...maybe you'll tell somebody? Itunes/Amazon reviews & ratings…It really helps an album to have lots of good words written about it. If you have 5 minutes…? The world needs music-lovers as much as music-makers. It never escapes me how much I need you. Humbly grateful you’ve chosen to be here in this moment with me.